DAIMONOLOGIA: Monastics Even Pray For Demons! Once a monk* felt much pain [of heart] and, while he was kneeling at prayer, he said the following: "You are God and, if You want, You can find a way to save these miserable demons who first enjoyed such great glory, but now are full of all the evilness and cunning of the world. Without Your protection, they would have devoured all human beings." While he was saying these words, praying with pain [of heart], he saw a dog's head next to him sticking out his tongue and mocking him. It seems that God allowed for this to happen in order to inform the monk that He is ready to accept the demons provided they repent, but they themselves do not want their salvation. One realizes from this incident not only the great love of monks, which they receive as a type of boundless love that is of God, but also the love of God, which is ready to save the demons as well, in spite of the billions of crimes they have committed, if only they would repent. 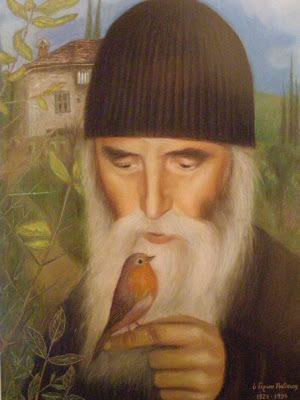 * We know from other stories of Elder Paisios that he is likely here talking about himself, since he later confessed that he once fasted and prayed for two weeks for the salvation of the devil, but the devil appeared to him after all that and merely mocked him. Source: Epistles, Elder Paisios of Mount Athos, Thessaloniki, pp. 90-91.